My family and I never have a bad visit. The staff is always extremely helpful and patient with all my questions. Very friendly staff...understood my being late due to unfamiliar area, ridiculous traffic ala LA style midday, and cheerfullyanswered questions. Dr. Watkins was a model of efficiency, just enough small talk, recommendations without being pushy....would definitely return & encourage others to give him & his team a good look. Very friendly staff...understood my being late due to unfamiliar area, ridiculous traffic ala LA style midday, and cheerfully answered questions. Dr. Watkins was a model of efficiency,just enough small talk, recommendations without being pushy....would definitely return & encourage others to give him & his team a good look. Dr. Watkins has a high tech office to serve you. His stylish offices offer both state-of-the-art technology as well as glasses for every budget and style. Come see us today. Dr. Watkins is originally from Chicago IL. He attended Truman State University and earned a Bachelors of Biology/Pre-Med. Dr. Watkins then attended Pennsylvania College of Optometry and earned a Doctorate in Optometry. 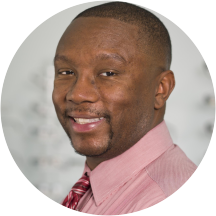 Dr Watkins has been practicing in the Phoenix area for over 12 years and has expertise in contact lenses, lasik co-management, and pediatric eye examinations. Dr Watkins enjoys being active at church, sports, and mentoring. Super amazing.he was able to get me in on Memorial Day. Very nice doc, fast service, thank you. Good experience. I recently visited this center for an annual eye exam. Scheduling was fast and easy, the front office staff was professional and friendly and I was seen within 30 minutes of my arrival time which is great. On the flip side,I felt as though the machine-based test portion felt rushed. There was no explanation as to the purpose of the machine-based tests, nor what the results were. Additionally, the reading test portion also felt rushed. The testing was completed in less than 10 minutes and I was given a sales pitch on purchasing glasses. As someone who has never worn glasses, I would have appreciated some additional information. What does the prescription I was recommended mean? How will it benefit me in terms of reading, computer use, driving, etc. How often should I wear them? Are contacts an option? Etc. I barely had a moment to think about what to ask, before the doctor was onto his next patient. Although the doctor was courteous and friendly, I've been used to a higher level of personal attention and care at my prior optometrist, where the purpose and results of tests were clearly explained, questions were encouraged and answered and I didn't feel as though I was being fit into a tightly scheduled window. Wonderful experience. Friendly staff. Quick turn around time. I was very pleased. Will recommend to others. Exceptional service and incredibly knowledgeable doctor. Puts his patients first! This is rare in the medical world nowadays. Thanks Dr. Watkins! Dr. Watkins and his staff were very personable, and also made this the fastest eye exam that I have ever had. The process to get an appointment was easy. I was seen right away - although I would have been fine waiting a bit because their waiting area is nice and comfortable. The doctor was nice, thorough and quick. Quick - ina good way. He did not skip anything, he just...gets to the point and moves you through the process in an efficient way. I would totally recommend this office! Very professional as well as personable! It was ca great visit overall! I plan on returning and using zocdoc more frequently! Myself and 2 sons had appts back to back. We all 3 were checked out, ordered 2 pairs of glasses, an out the door in 45 mins! Most hi-tech office I have been to. I will be going back. He cut to the chase. Normally I spend a long time either waiting for the doctor or going through every single test possible. Dr. Watkins came in knowing what level my vision should be at, then gave me a quick testto prove my eyes had gotten just a bit worse. I didn't have a long "A or B, which is clearer" test and he explained why a picture of my eye is necessary where no other doctor has before. He's very mild mannered, but thorough and efficient. I chose Dr. Watkins based on reviews ready written about him and he did NOT disappoint! He and his staff got me exactly what I needed and I was checked in as a new patient, seen, and satisfied in 25 minutes! Amazing! Friendly staff and very helpful. On time with appointments. It was a great experience. He was quite informative and provided descriptions and examples of his diagnosis. I was skeptical when I pulled up to his Phoenix office because of the neighborhood, but once I came in, I was greeted by the doctor himself right away, had all my questions answered and felt well taken care of. Hespends as much time with patients as they need and seems to really care about making sure they are happy and healthy. I highly recommend him! It was great and he answered all of my questions. Dr.Watkins was super nice very friendly and made me feel comfortable right away! I take both my boys to Watkins. I travel 30 miles to him. He is an amazing person who explains things completely and my boys love him. Awesome! Great front desk, very friendly. Dr. Watkins was very cool! I plan on keeping him as my primary eye doctor, as long as he doesn't move his practice. Would recommend Torrence Watkins to anyone. He was very friendly, staff were outstanding as well. He was very knowledgable and helpful, gave me all of my options and did his best to make sure I was taken care of. Explained my condition and options really well! Told me pros and cons of alternative treatments which I really appreciated. Very professionable as well as personable. Great experience, very friendly and made some very good recommendations. I couldn't be any happier with the service I received from Dr. Watkins or his staff.